A quinceañera features elements similar to those found at a Sweet Sixteen bash or a debutante's coming out party. It requires extensive planning and advance preparation to ensure its success. This event takes place on a girl's 15th birthday and is a special and memorable occasion. A quinceañera, also called Quince Años or Quinces, is part religious ceremony and part coming-out party. According to MexConnect.com, the quinceañera was a sign that a young lady was ready for marriage. In modern times, it symbolizes her journey to adulthood. While the details vary from culture to culture and can also change to accommodate family preferences, a traditional quinceañera typically includes several key elements. When planning a quinceañera, it is essential to first determine a date. You should try to choose a date that is as close to her birthday as possible if not on her actual birthday. You will also need to reserve a venue to hold the party. You can choose a local restaurant, banquet hall or event facility to hold the party. You'll want to plan a few other details right away so you can continue with planning in an organized manner. If you are planning a religious ceremony, you will need to book a priest, the church and a mass. You may also want a rehearsal so that you can have a walk-through before the actual day. Many girls want a specific theme or color for their party so when planning, take this into consideration as well. Roses would be a lovely theme, while a princess theme is fitting for the celebration's traditions. 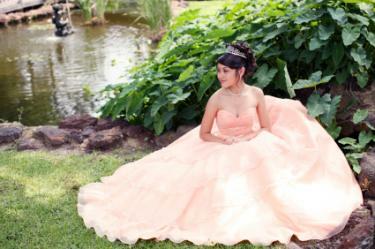 Quinceanera Invitations: All invitations on this site can be printed in either English or Spanish. You can choose what you want to write in them as well as choose from standard verses. 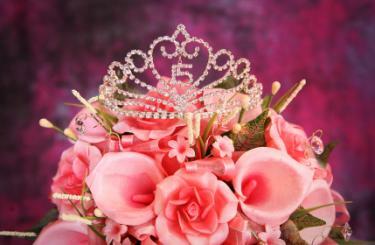 Quinceanera Boutique: Choose to write your own wording or pick a verse from the selection found at this site. Invitations can be ordered in English or Spanish or the language of your choice. 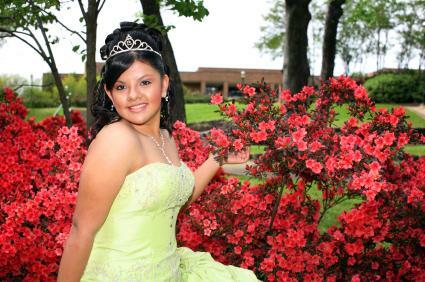 Quinceanera Mall: Find elegant and affordable invitations in a variety of styles at this site. You can choose a do-it-yourself type invite or one that is more extravagant. Majestic Invites: Search the unique selection of invitations on this site made from the finest rare imported papers. All invitations can be customized to your specific theme, color and needs. Have the birthday girl choose a list of people that she wants on her court. This can be a mix of girls and boys close to the honored girl. This can include friends and relatives. She should carefully consider her list before asking people to do her this honor. Be sure to do this in advance so that the court can get dresses and suits in time for the celebration. Pretty Quinceanera: Find a large selection of dresses from those on sale or clearance to those that are new designs in the latest styles. You can search for dresses by categories such as traditional, popular, modest as well as by brand or color. Quinceanera-Boutique: This online boutique has a great collection of dresses by Stella sure to make any birthday girl excited about her big day. Gowns are done in strapless styles with optional straps and are all fully lined. Cinderella Gowns: With over 5,000 dresses in stock, any teen girl who wants to feel like a princess is sure to find something to suit her taste at this site. Expect to find a selection of gowns in a range of colors, styles and sizes. A traditional religious ceremony is an important element to consider. Some families prefer to keep with tradition and plan this in advance with their church, while others don't include the ceremony as part of the big day. It is matter of personal preference and is appropriate either way. You will want to plan a menu and hire a caterer or discuss options with the restaurant where you are holding the party. The menu can be as simple or complex as you like, from an appetizer buffet to a fully served sit-down meal. A festive cake can serve as dessert and a decorative element at the party. 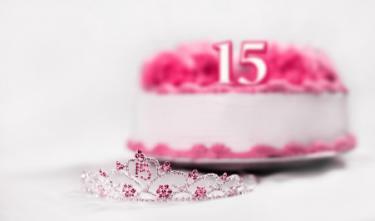 Quinceañera cakes can be done in the theme color and have the teen's name and the number 15 written on it. You may want to have party favors to thank guests for attending the celebration. Favors are often done with the birthday girl's name and the date of the party. You can find a great selection of party favors at a local party supply store. In addition to favors, you will also want some fancy quinceañera decorations. Decorations such as balloons, streamers, candles and flowers are often used. Plan to give the birthday girl traditional gifts of a tiara, a bracelet, ring or a pair of earrings. These gifts will be treasured for years to come and will remind the birthday girl of her special day. 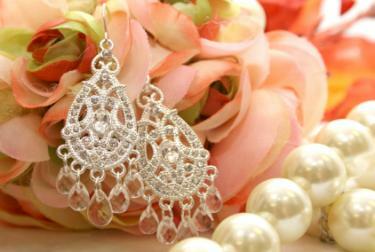 Depending on your budget, a quinceañera could rival the reception of a well-heeled bride. Like brides-to-be, some girls spend months collecting photos of dresses and flowers they want featured at their quinceañera. However, drooling over magazine articles won't yield the party of your dreams. Success lies in careful preparation. With proper planning, this once in a lifetime experience will be one that is cherished forever.